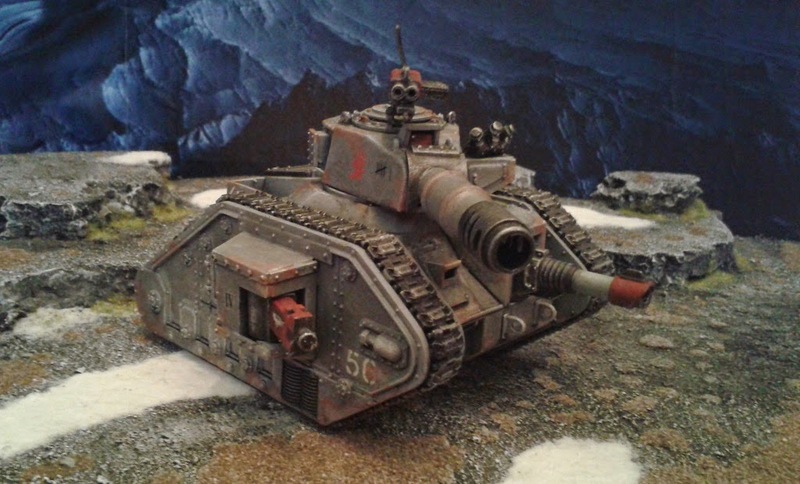 In my last post I'd got as far as adding some decals and details to my tanks. 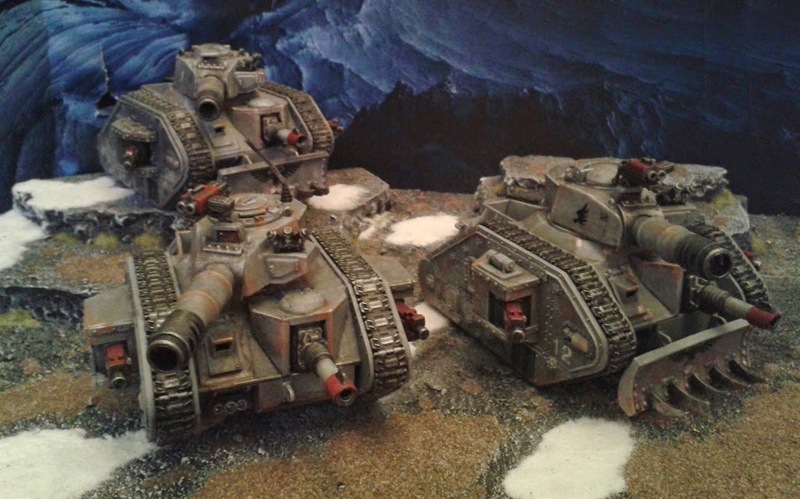 That left me with tanks that looked clean and undamaged, fine for play but a little too "healthy" for my liking. Also the chalky effect you get when drybrushing was a little too pronounced for my liking. So, to finish these guys off a little weathering was needed. I started off with some very simple sponge-weathering. 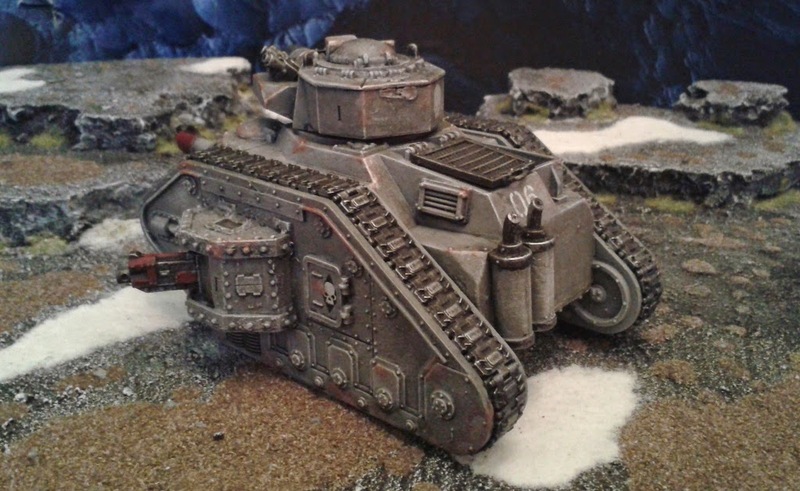 For the uninitiated, this is a really easy technique for creating rust and exposed metal where paint has chipped away. simply get a small piece of open-cell sponge (something where the "holes" or "pores" are not too small - 0.5mm - 1mm in diameter is fine). You only need a piece of sponge about the size of a peanut for this. Hold it firmly in a pair of tweezers or similar and dip it in your paint. Dab excess off on a tissue and then start working on the model, aiming mostly for edges and corners. Don't go overboard or you end up with something that's almost leopard-spotted. I normally work in just two layers - I start with a Terracotta layer (which can look like exposed red-oxide primer or rust depending entirely on how the viewer percieves it) and then add a layer of quite a bright metallic (Citadel Chainmail in these pics). That's it. Done. I then brought the whole look of the mini's "down" a bit. At this point they're too bright and clean for my liking - I wanted something a bit more dirty and oily looking. I recently picked up on a technique known as an Oil Wash (also known as a Pin Wash). It's normally used to pick out seams between armour panels, but I applied it to the whole model in this case. You need some white-spirit and artist's black oil paint. Mix a little paint with some white spirit in a container until you have a runny paint that will run down the side of your container in much the same way as milk would in a glass (maybe a little thinner than milk, actually). As a pin-wash you would then pick some up on a brush and touch it to the panel seam on your model and capillary action would draw the oil from your brush and flood the seam. Any excess can be cleaned off with a cotton-bud (q-tip) with a little clean spirit on it. I went in much more heavy handedly and used a large brush to coat the whole model. It's given a nice oily patina, picked up a lot of the seams and also taken out a lot of the chalky brush-marks my earlier heavy drybrushing had introduced. And that's it, aside from a squirt of varnish. Last time I had textured my models very quickly and simply. This brings my tanks to a stage where they are ready for the penultimate stage of detailing and adding decals. 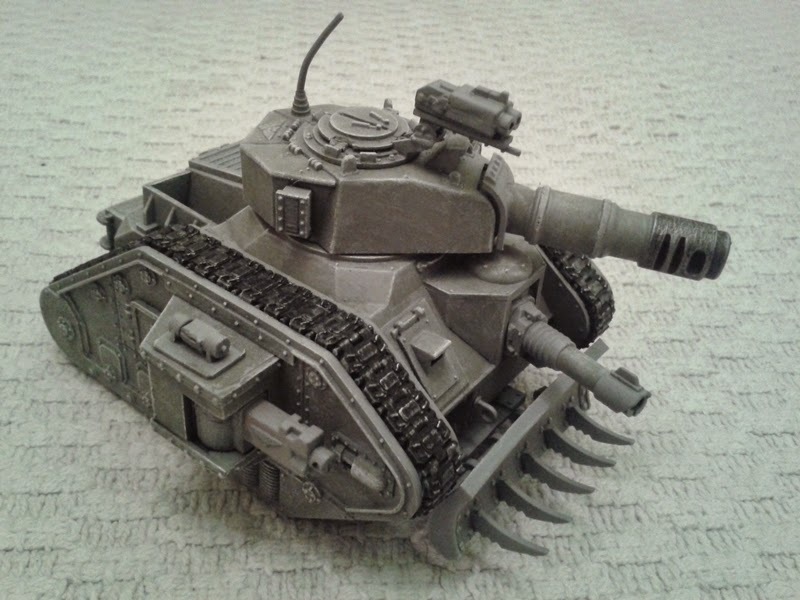 I'm very much an advocate of the school of thought that says "for a good table-top standard finish, you don't need to paint every part of your model". A textured basecoat with good (but minimal) detailing and some weathering really (for me) does the trick. Like I said - detailing is minimal. I've basically added some red to the guns, picked out the Aquila's and painted the aeriel, lights and sensor lenses. Maybe 15 minutes work per tank. I've added a few decals too (I actually went back after these snaps were taken and added some ID numbers - you'll see them in the final part of this little series). And that's it - weathering next (which is just as easy as the stuff I've done so far. 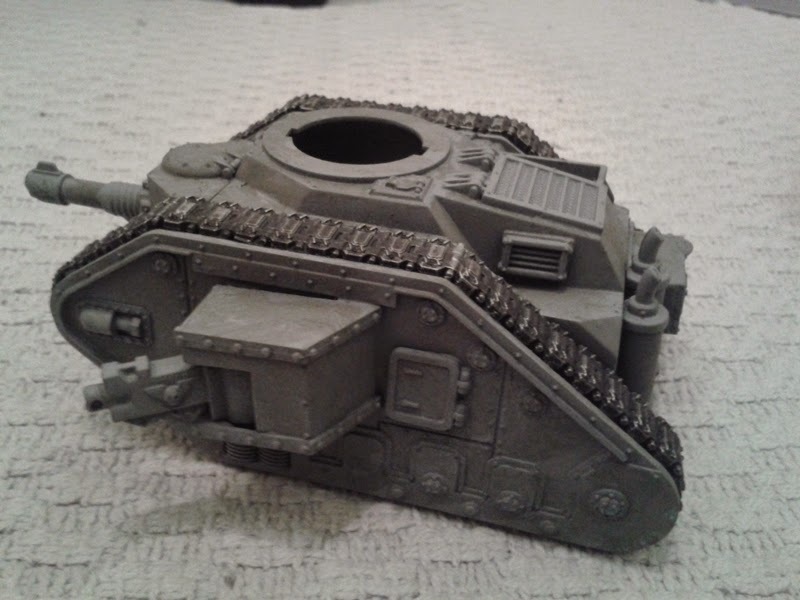 Cracking on with getting my Leman Russes painted up what I tend to do after basecoating with a flat grey primer like I showed in my previous post is to add some texture to the tank's paintwork. 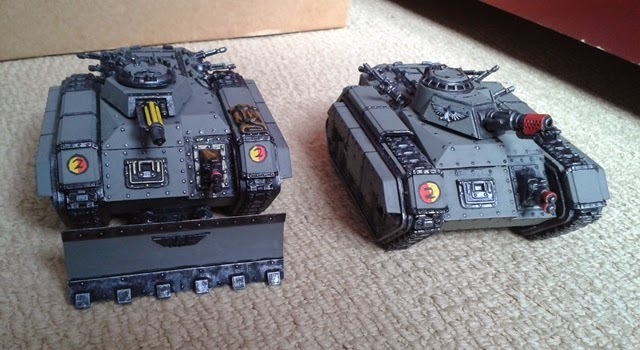 These are intended to end up looking like they've been in service for decades and have been shipped from one theatre of war to the next, so the paintwork is going to look like it's been around a while in different atmospheric conditions. 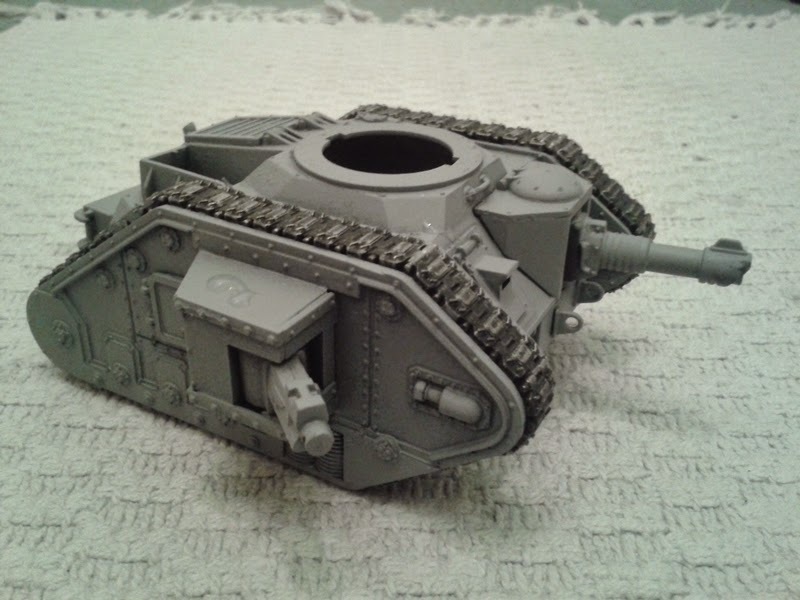 So the first thing I have done is to liberally and randomly apply more grey paint over the body of the tank. 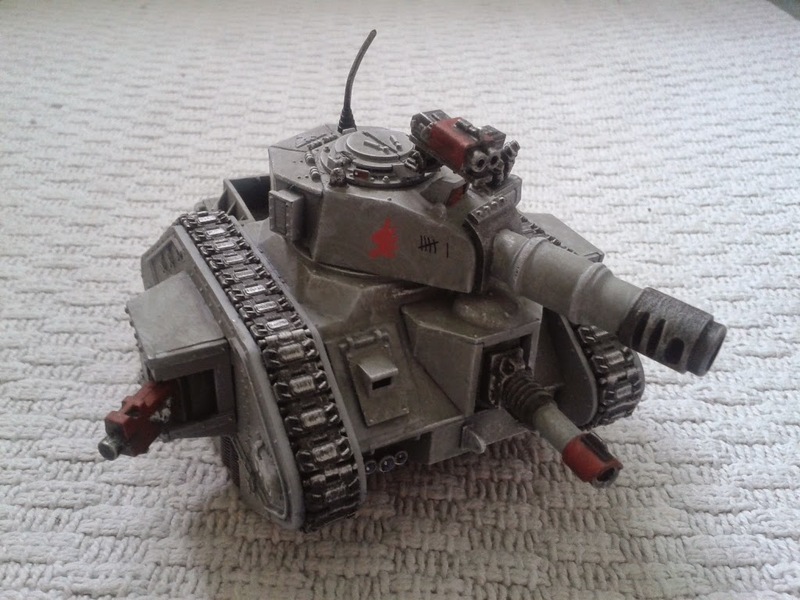 This is a slightly darker shade than my rattlecan-basecoat and is just very quickly and roughly painted on with no attempt to make the finish look consistent ot neat (other than to avoid the metallic parts). Next the whole model gets a single, quite heavy drybrushing with white paint. 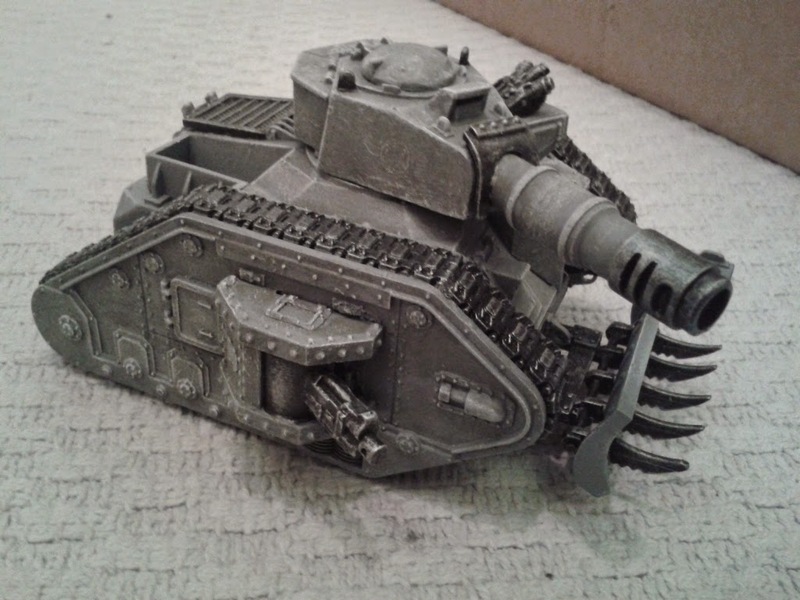 And in this photo I've blacked in and then metallic-drybrushed all the metal bits. This is intended to be a quick process. I'm working on three tanks at once and all this stage took was about one hour to do all three. 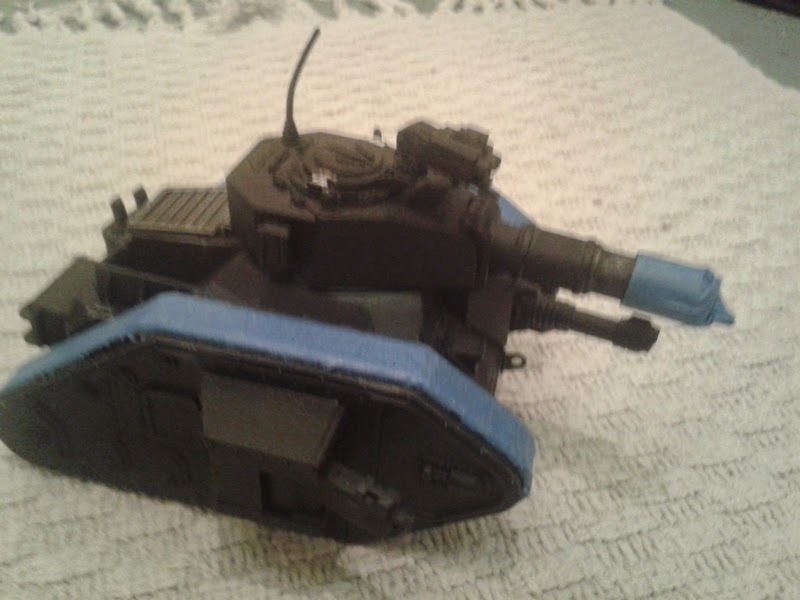 Next I'll add some details (gun barrels, lights & lenses etc.) and decals. Given that the majority of what I've done on my blog has been W40K based this is quite a moment for me: 40,000 hits since I started it up a little over 2 years ago. That for me is an incredible figure and I'd just like to thank all the people who have ever taken the time to stop in, look at one of my posts, +1 or write a comment. My genuine thanks go to you all. 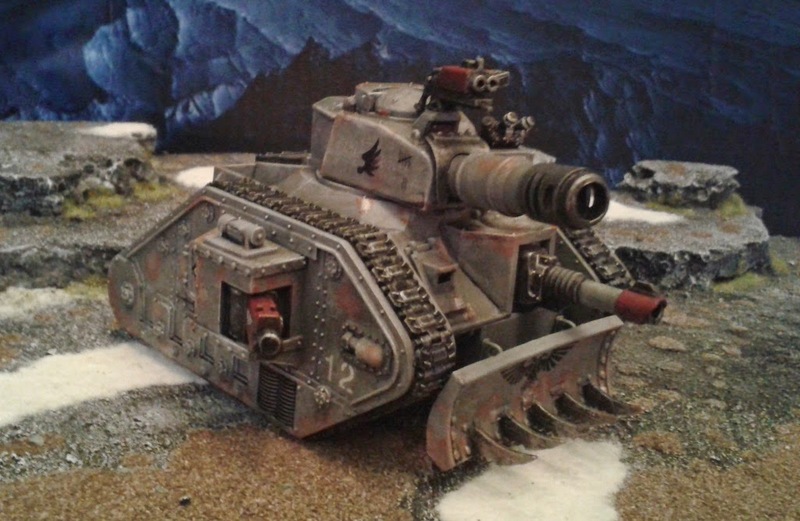 So off we go on the final phase of tarting up my Imperial Guard/Astra Militarum (whatever they're called this week). For no real reason I decided to start with my Leman Russes. Masking tape removed after sraying. In my next post I'll add some texture to the grey paint as this is very "flat" at the moment. 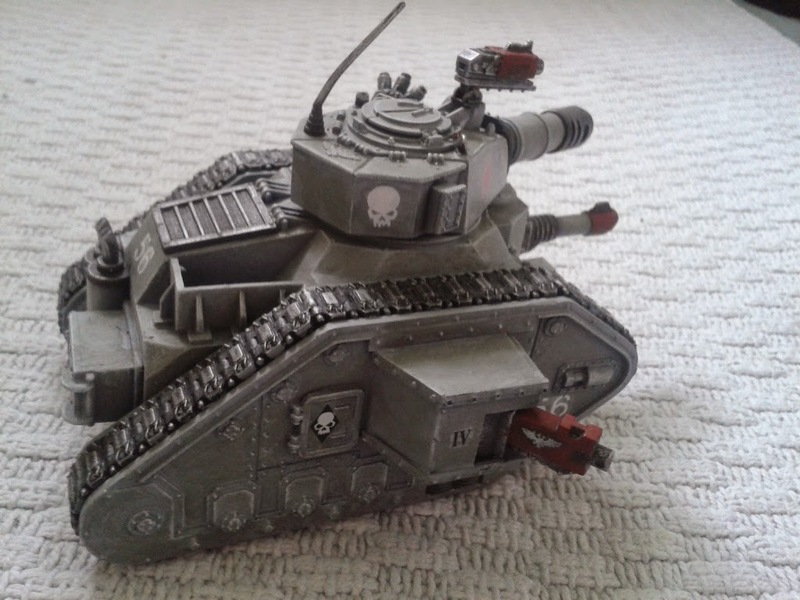 Now that I've finished my Sentinels to the same standard as my Valkyrie and Baneblade, it's time to turn my attention to my other tanks. 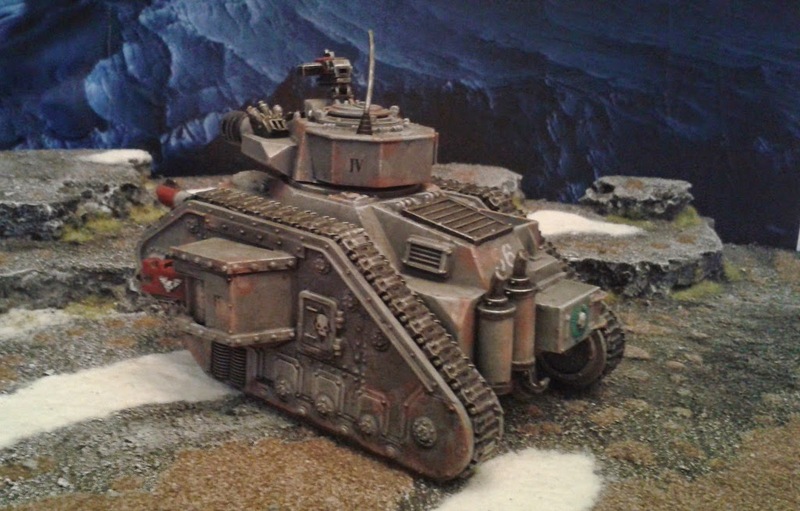 Since I first painted my tanks I've picked up a few more models (a Leman Russ bringing my total to three, a pair of Chimeras [which have no turrets!] 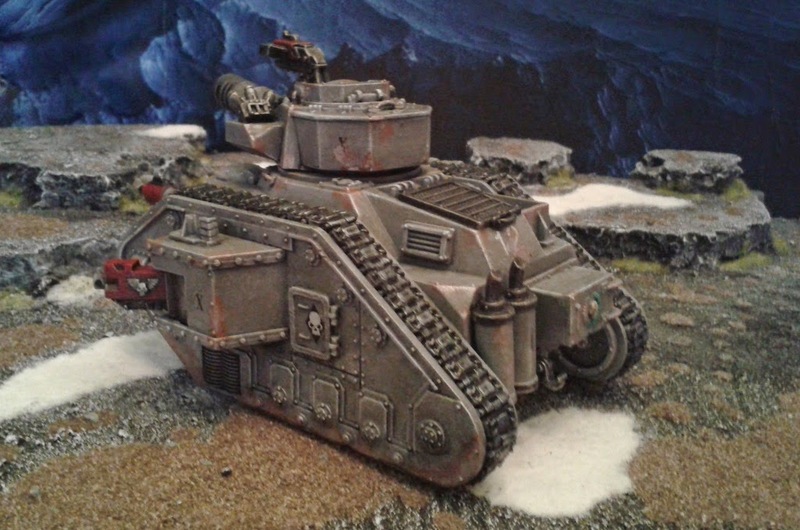 bringing my total to four, and a Forgeworld Solar Auxilia Dracosan Transport with several bits missing). 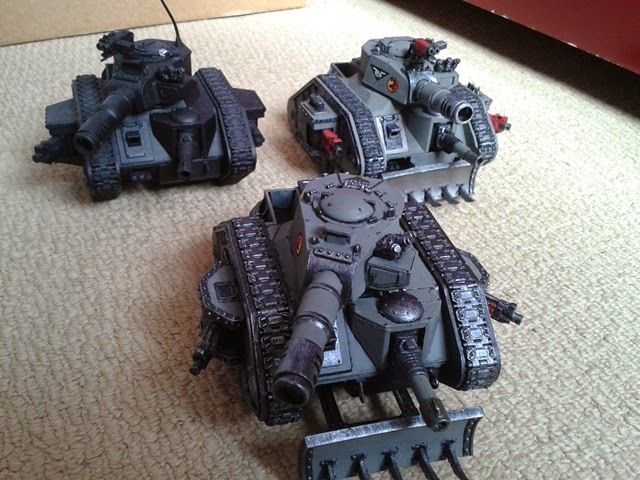 So I have 9 tanks to paint (or repaint) some of which (two Chimeras and the Dracosan) need extensive modelling work to bring them up to scratch. 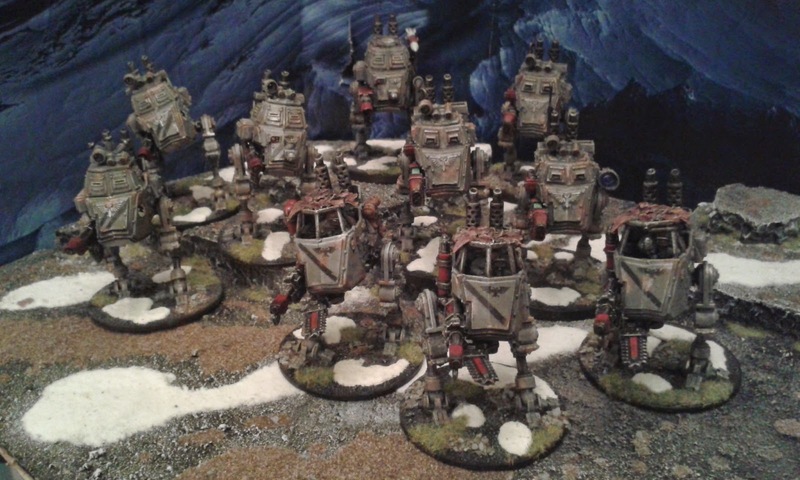 I'll create a series of posts over the next few weeks dealing with these item-by-item starting with my Leman Russes. And this is the last squad to be rebased! That's it! I'm done! Finished! Wahey!! So what's next? Tanks... 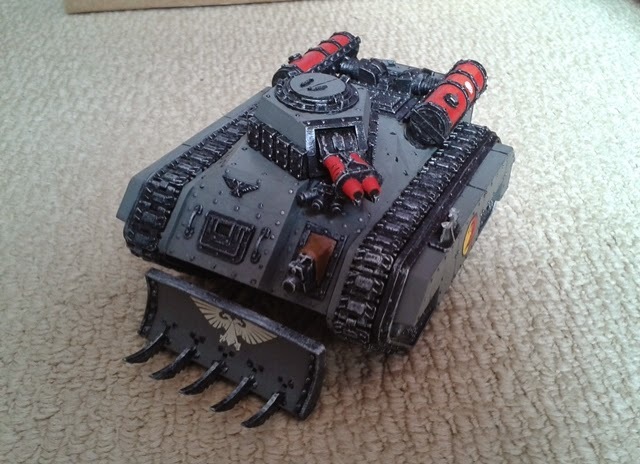 I have a set of tanks which are not up to scratch when compared to my Sentinels, Valkyrie and Baneblade. From the outset I''ll say Multi-lasers - not my favourite weapons. Much like shining a set of torches at the baddies. OK against soft targets but rubbish against anything with even moderate armour. So why did I build them? Simple: This whole project has been built out of ebay scrap lots which I picked up for (total) less than £50. At less than £5 per Sentinel (as opposed to the current retail price from GW of £18.50 each) I was prepared to take what I could get and what I got was Multi-lasers. 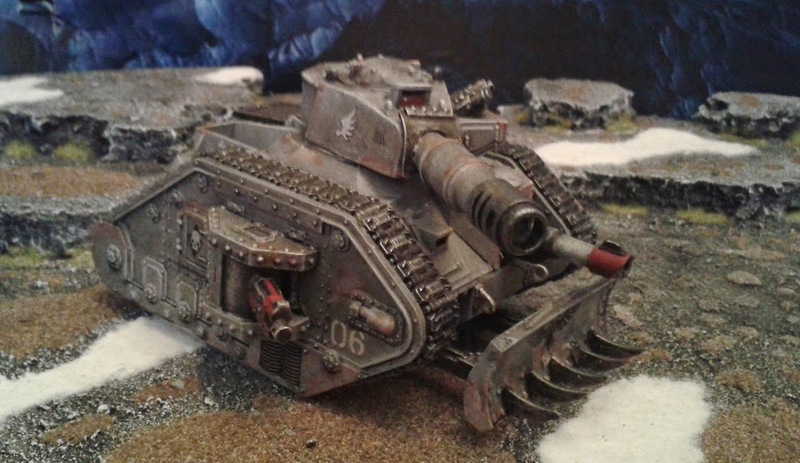 They look similar enough to Lascannon that a "counts-as" isn't a great stretch anyway. 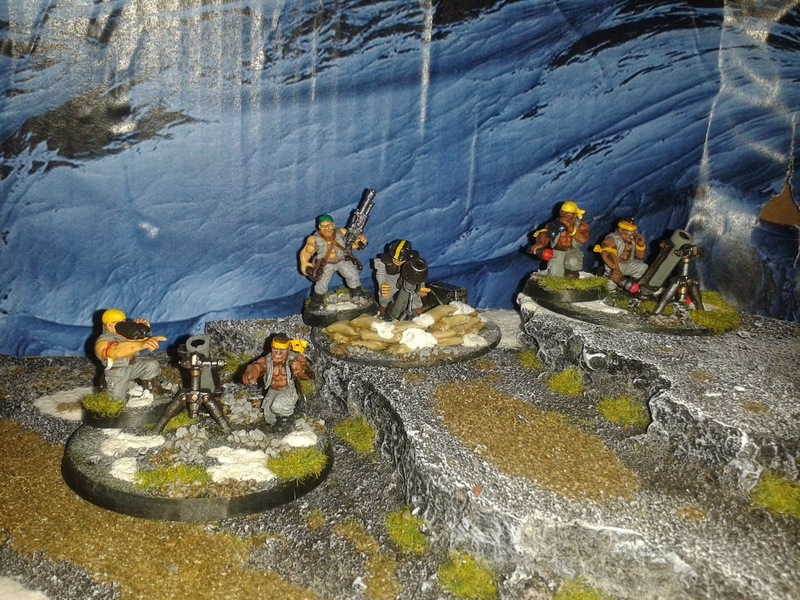 Anyway - this is the final squad to complete my platoon (a group-shot will follow in my next post on the subject). 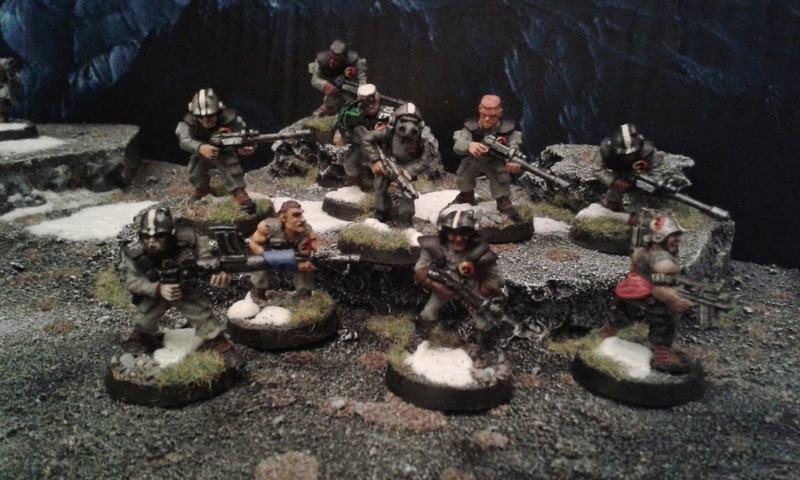 Here's my penultimate Command Squad - you can probably tell but the voxcaster is a conversion! I've swapped so many models around in my command squads during this project that I don't really have a representative picture to show! 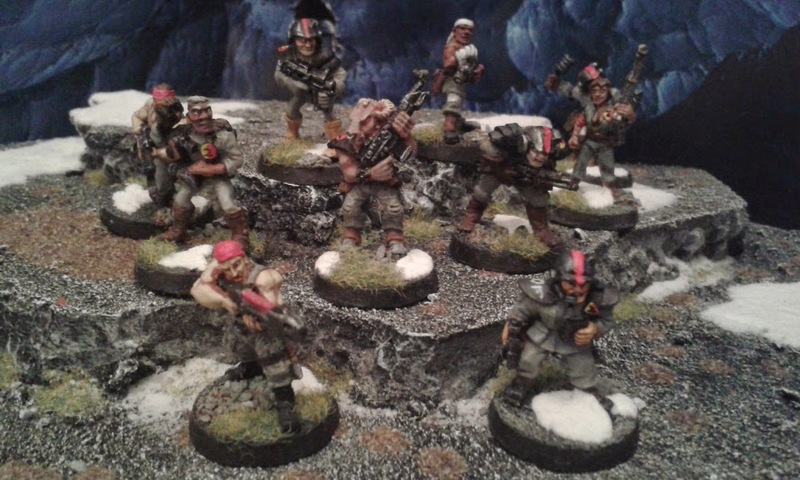 This is the last of my 7 Platoon Squads. 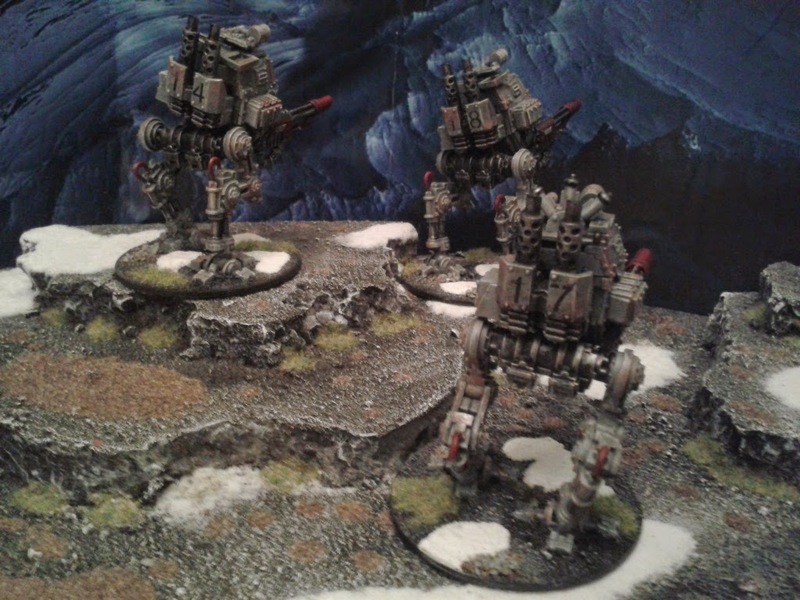 Unlike most of my squads this one is unique as it's completely made from (mostly legacy) metal models. As such there are a couple of great (and probably quite rare) models in it. 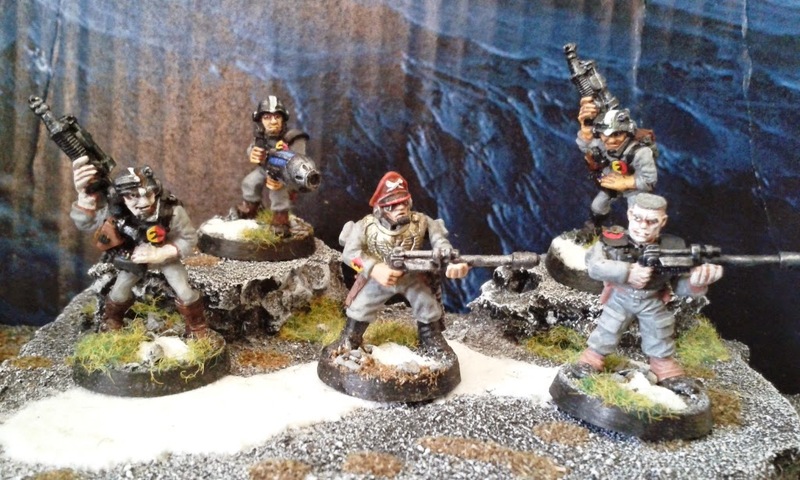 Upper-right is a female guardsman - one of my favourite models in the whole army. Right in the middle of the photo is a Beastman! Yep - back in the day the Imperial Army (as was) used to contain regiments of Beastmen. True - look it up if you don't believe me. 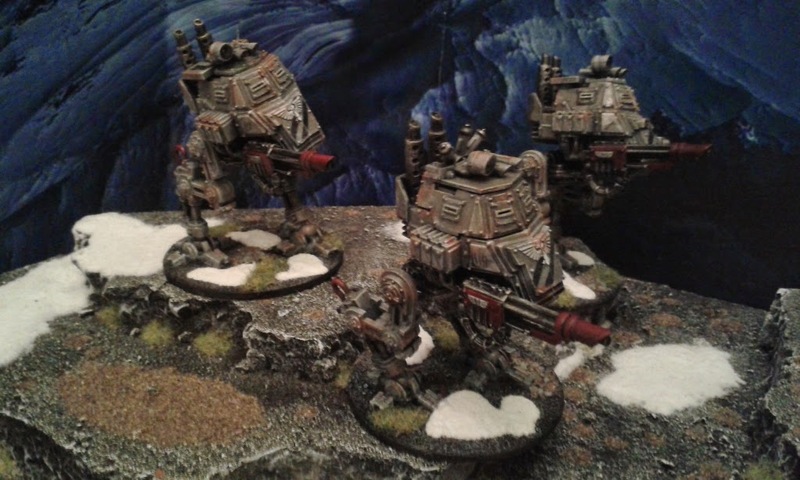 Here is the last of my Heavy Weapons teams - a Mortar team. 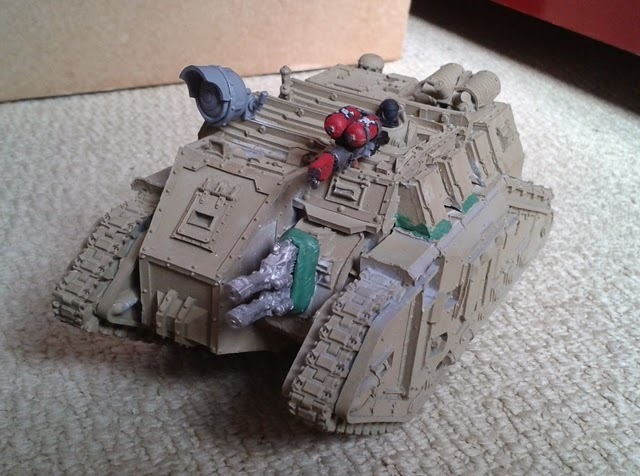 I had doubts about the efficacy of this team when I was building it, but in the one game I've played with it (which was a Cities Of Death game against a combined force of Orks and Eldar) it took "squad of the match" as it dealt out a great deal of unpleasantness to the Orks. 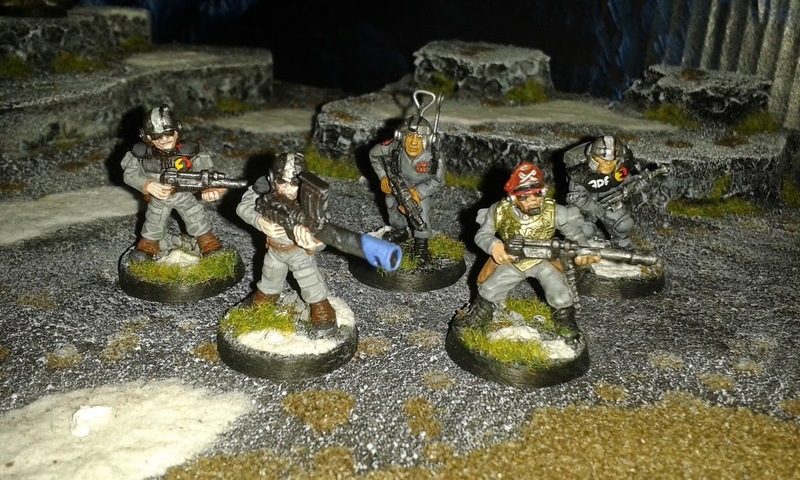 Here is my penultimate platoon squad (I've not done these in numerical order - this is squad 6 out of 7). 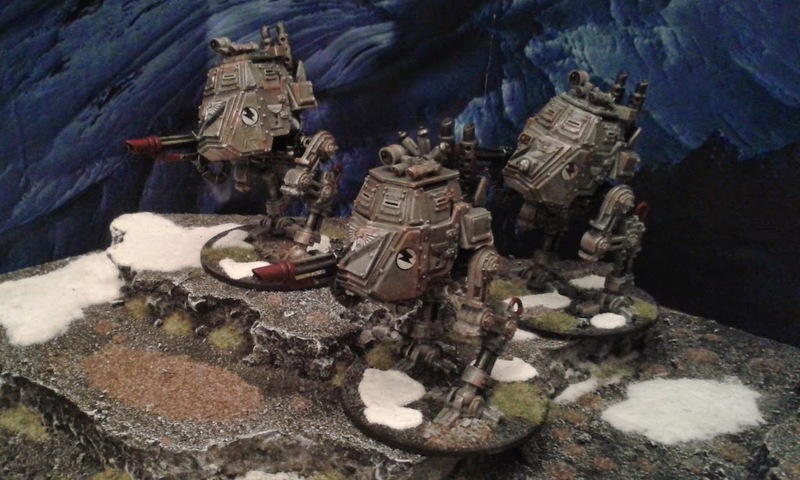 It's the usual mix of legacy metal and plastic models that characterises my army. I've actually finished all the work on rebasing my army now so all that remains is photographing and blogging the remaining units. I'm particularly looking forward to blogging the final squad in a few days time as it has some brilliant models in it (the like of which has not been seen for decades! ).